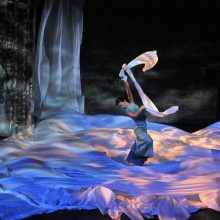 "Ashesh Barsha," set in a world out of balance, is an intense examination of issues of climate justice and witnesses the horrifying transformation of life-sustaining phenomena into deathly forces, and of natural resources into privately owned commodities. The unending monsoon is a metaphor for a world torn asunder by global warming’s howling winds and towering waves, irresponsible global industrial policies, toxic spills, and land appropriations from indigenous communities. 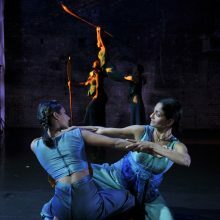 “Chatterjea works wonders with Odissi, making the dance form’s high tension and sharp angles look now like the stylized motions of laborers at looms or in fields and, now, like the anguished grammar of pain and despair. 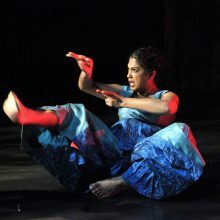 Her Odissi flips from a prison to an outflow of fierce emotion. 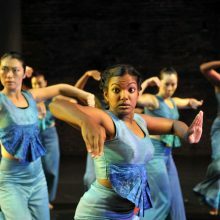 Dancers: Sherie Apungu, Ananya Chatterjea, Grace Gathaara, Yan Huss, Yonci Jameson, Gina Kundan, Simran Kundan, Srija Chatterjea Sen, Stefania Strowder, Jasmine Kar Tang, Chitra Vairavan, Pramila Vasudevan, Hui Niu Wilcox, Alessandra Lebea Williams, Kayva Yang. Composition and Sound Design – Shubha Mudgal and Aneesh Pradhan Musicians – Shubha Mudgal (voice), Pratap Rath (percussion), Aneesh Pradhan (percussion), S.Sankarnarayanan (tavil), Sheena Khalid (recitation). Additional music effects from Open Source Audio (Creative Commons license: Public Domain): Shakuhachi played by Michael McInenrey extended by Zlatko Baracskai with sensors controlling live processing software. Artist/Composer: Michael McInerney & Zlatko Baracskai Recorded, mixed and mastered by Tanay Gajjar at Ava Studios, Mumbai, assisted by Pranam Pansare. 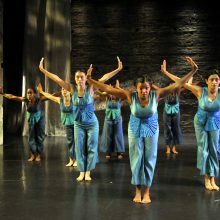 In 2006, Ananya Dance Theatre began working with advocates and researchers Cecilia Martinez and Shalini Gupta, to explore issues of environmental injustice with a particular focus on global communities of color. Our initial idea of creating one piece on this theme quickly faded when we realized the immensity of the issues we were dealing with. 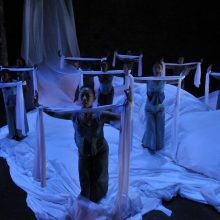 Out of workshops, conversations, and movement explorations, emerged a commitment to a trilogy on environmental justice, each piece opening up yet another dimension of the issues. 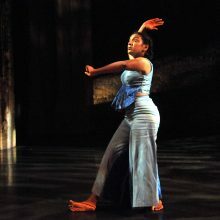 Since then, we have been engaged in an intensive learning process about particular environmental hazards in our communities and outside, proposed solutions and the inequities they sometimes perpetuate, and the work being done at grassroots levels by women and global communities of color to urge sustainable solutions to the environmental crisis. With Ashesh Barsha, unending monsoon, we celebrate the culmination of this trilogy, yet we know that this culmination only indicates a further journey—the work must go on! 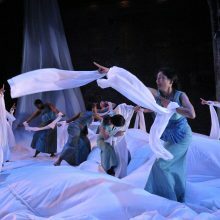 Our 2007 project Pipaashaa, extreme thirst, explored issues of toxic industrial spills and the damage and “body burden” caused by them. Our research included the dumping of toxic waste in Cote d’Ivoire and the ensuing protests in Abidjan, as well as the soil contamination in Minneapolis’ “Arsenic Triangle” area and the continued efforts of organizers to get this addressed. 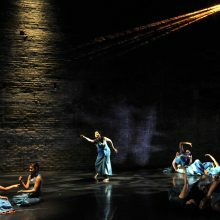 Working through images of acid rain and falling ash, which burned into the skin of dancers, interrupting their work, we explored metaphoric expression of the trauma caused by such pollution. We created images of madness and un-natural relationships to suggest the physical manifestations of these toxics in women’s bodies and the kind of emotional, cultural, spiritual, and societal toll that has resulted from this body burden. 2009: Energy and climate. Ashesh Barsha, unending monsoon, is set in a world out of balance, and witnesses the horrifying transformation, over time, of life-sustaining phenomena into deathly forces, and of natural resources into privately owned commodities. The unending monsoon is a metaphor for a world torn asunder by global warming’s howling winds and towering waves, results of irresponsible global industrial policies and unbridled consumerism. This is also a world rent by deepening fissures between communities who have reaped short-term benefits from aggressive industrialization, and also have resources to cope with the consequences of this imbalance, and others, who are most often the least responsible for the emission of green house gases and other such phenomena, but who are at the receiving end of long term disastrous consequences. Through our creative process, we repeatedly tried to ask the questions: What is “progress”? What is a “good life”? Who owns the air we breathe freely? What causes our “complicity”, even forced, with the over-consumption of energy? How can we, or can we even, reclaim what is lost? 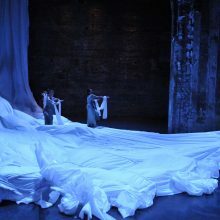 We tried to understand, through breath, rhythm, touch, and line, the emotions of greed, pain, rage, and hope. 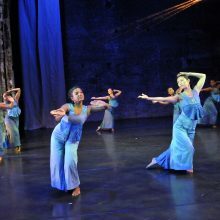 Through Ashesh Barsha, I, along with the dancers, have endeavored to make palpable, the core of human suffering and loss, fortitude and hopefulness, that lies at the core of environmental issues. 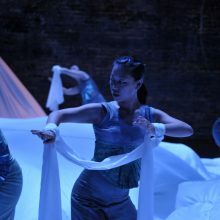 We offer it to our audiences with humility, inviting you to join in our questioning! We have both been students of Hindustani music for decades now, and therefore much of our work speaks through the grammar and vocabulary of raag and taal. In some ways, it is in this complex system of music that our work is deeply and securely anchored, and yet we do try and set sail in different directions now and again. 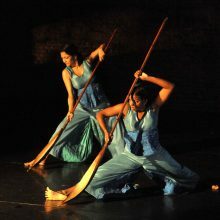 The soundtracks we have created for the trilogy by Ananya Dance Theatre, now in its concluding chapter with Ashesh Barsha, have given us ample opportunities to test ourselves and see if we are indeed ready to step outside the more familiar parameters of raag and taal. The challenges have been many, and the process of creating and recording the soundtracks has involved learning, unlearning and then learning all over again. At times, it has been easy for us to shed raag structures and play with sound by using timbre, texture, phrases, and clusters that we would perhaps never use otherwise. And at those times it has been easy because of the support we have received from every individual in our team. We have recorded the soundtracks in Mumbai, at AVA Studios, where normally soundtracks of blockbuster films are deftly created and packaged. And yet audio engineer Tanay Gajjar and his team have been open to our requests driven by an entirely different orientation. They have readily agreed to try and capture or re-assemble the sound of construction work, of steel girders being lifted and thrown to the ground. 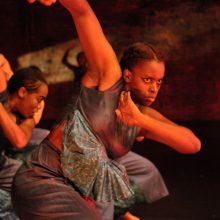 They have helped us find just the right amount of thunder and rumble in the sound of the myriad drums and percussion instruments we have used in these soundscapes. Musicians we worked with have extended themselves, and have unflinchingly agreed to play only a few strokes on a drum where they would normally play incredibly complex rhythms at breakneck speed. 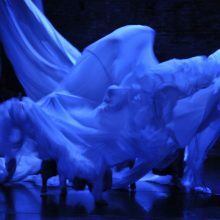 As and when we ourselves have performed on the soundtrack, we have attempted to use dynamics, dissonance and atonality and contrast to highlight or complement the choreography. But above all, we have enjoyed punctuating the soundtrack with moments of silence. 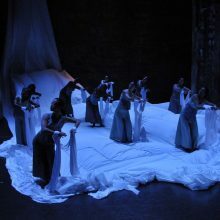 And in these silences you hear the breathing of the dancers, the sounds of their feet, and the rustle of their clothes. In doing so, we become part of the group which otherwise, is separated from us by huge and often insurmountable geographical distances. 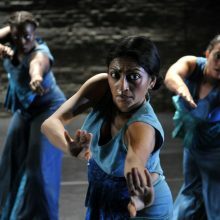 Ashesh Barsha has once again brought scholars, activists and artists together for this last piece of Ananya Dance Theatre’s environmental justice trilogy. Ashesh Barsha presents us with the ultimate moral challenge. Will we persist in our quest for a material life? Arrogant disregard for the earth and for the exploitation of peoples has rested in the belief that we would never have to pay the price. Industrial societies have acted as if indiscriminate use of the earth’s resources is our right. Yet our standard of living has left those without resources at the mercy of an earth out of balance, and the answer seems to be that we can “green” shop our way to absolution. The fact is that the people most affected by climate change are the least responsible for the problem – both globally and within the United States. Climate change is not the problem, however. It is the symptom of a diseased and amoral society of affluence. We see that in the stories of local contamination of our bodies, stemming to the land, and now it is global warming – the globalization of the ecological degradation. Grassroots stories from around the world show the hope for solving climate change in just and sustainable ways. True solutions exist within our own communities and our own histories, not in mimicking a “green” version of the industrial growth model. Women of color and indigenous women around the world are not only resisting, they are leading the way in creating a new vision of the future. 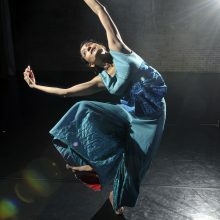 Our work with Ananya Dance Theatre has been in the spirit of this endeavor. 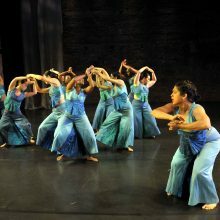 Through art and critical analysis, our Center for Earth, Energy and Democracy worked interactively and collaboratively with Ananya Dance Theatre to, as women of color, offer our expressions of Climate Justice.